I have been so busy recently that I haven't had much time for creating. And you all know how desperately I need my creative fix each and every day. So, since I was running woefully low on my life blood, I decided to go downstairs to my Creation Station for a little infusion. And, the result was a lot of fun! And I felt so much better when I was finished! While I love all the separate components -- I mean, aren't those bows delicious? And the stamps that were included were outstanding (although I must admit that I can't quite come up with an occasion for which I would use the word "DUDE".) 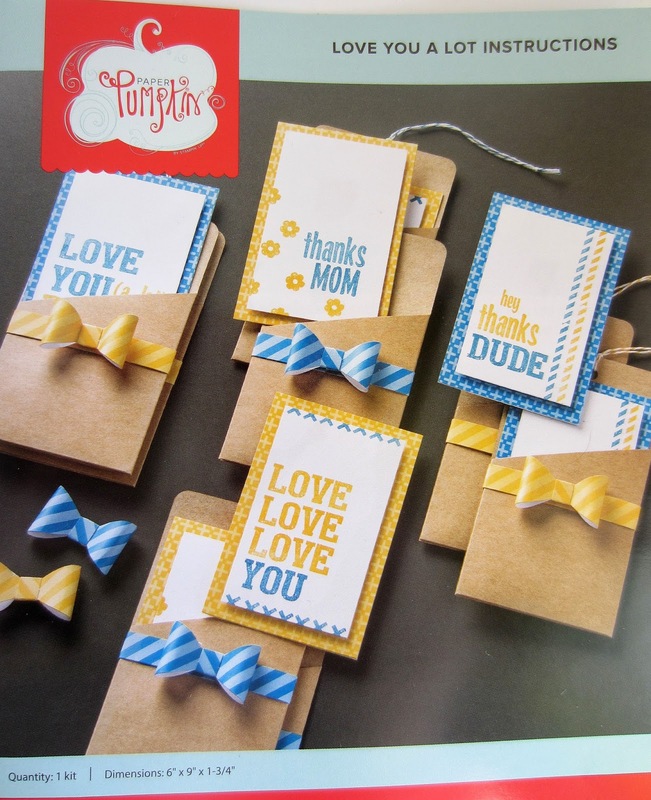 The cards themselves were awfully cute, as were their little kraft pouches. B U T, I simply wasn't inspired. I keep trying to catch peeks of the card since last night, not quite believing that it grew from MY imagination. Those little Paper Seedlings brought forth a pretty nifty creation. The yellow portion of the card was one of the included card bases cut in half and used as a mat. In the following photo, you can see a close-up of the top of the card. The "glasses" are what remains after you punch out the pieces for the bow. I simply cut off the white portions. 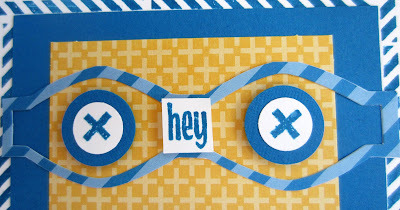 The "hey" the "x" in the eyeballs, the "YOU" and the striped edge are all stamps that came with this kit. The "YOU" stamped on Whisper White was punched out with the Large Oval Punch. The striped Baker's Twine came with the kit. 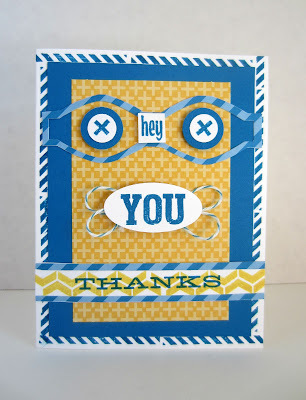 I used several Stampin' Dimensionals to make this card pop even more. 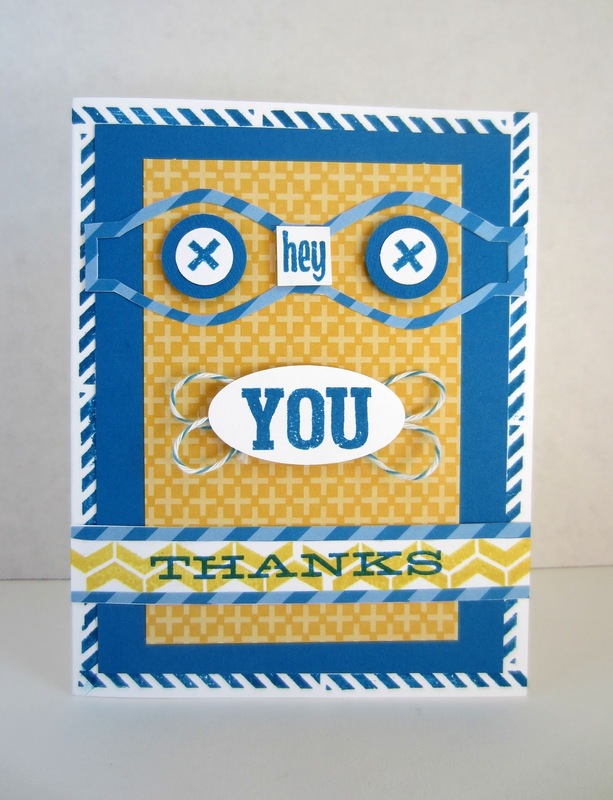 The "THANKS" and the split chevron were from past Paper Pumpkin kits. 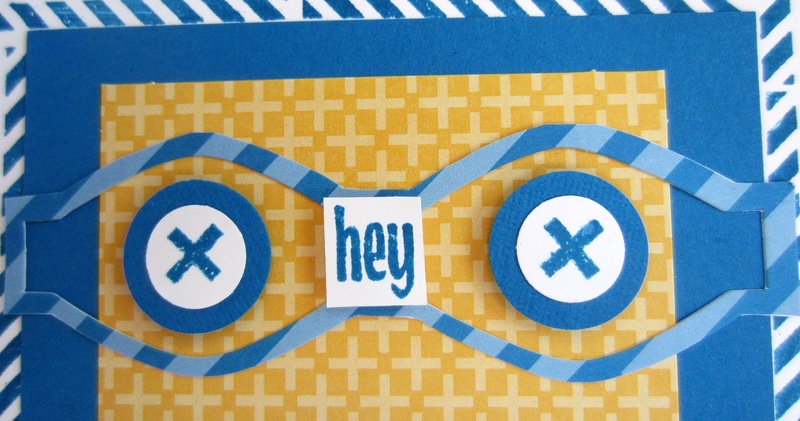 The striped edges on the top and bottom of this piece were snipped from leftovers from the Love You A Lot kit. 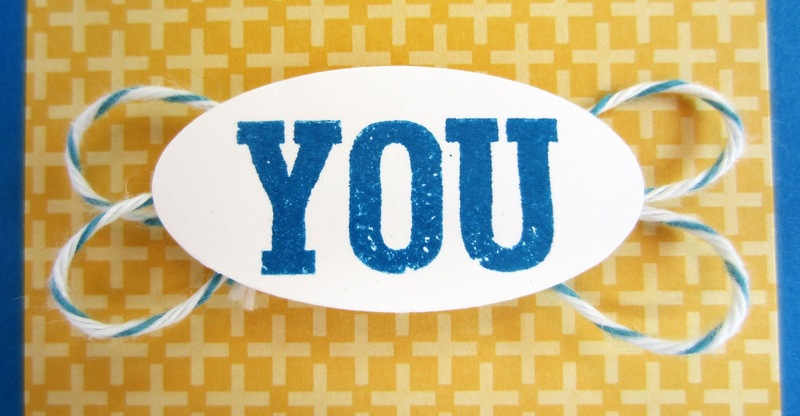 Hey YOU, what do you think? These are so cute! I love the glasses! Love the card. Pinterest is being a pain and not letting me pin anything. I think it's cute and my grandkids would love it as well. Thanks for a fun and creative visit via The Dedicated House. Ha, I definitely prefer your card to the ones you were meant to make. They're okay, but sort of meh. Yours is much more eyecatching, although I can't help it's the first step on the road to robots enslaving humanity and taking over the world. And it keeps staring at me. Why is it staring at me? The cards that came with the Kit was OK but I like the one you made much better. Also I had not heard of the place the cards came from so I look forward to checking it out soon. I love them. I think yours are more creative! So cute!! Thanks for sharing on My 2 Favorite Things on Thursday!! I love having you! Hope to see you again on Thursday! Pinned!